Anyone who has read this blog or who knows me knows that I am a fan of confession. I'm such a little geek that I even have an Excel spreadsheet listing all of the parishes nearby with their times for reconcilliation. (To be fair, I also have the times for daily mass as well as adoration on there.) One thing that has bothered me for awhile is how seldom the sacrament of reconcilliation is offered in many parishes. I would like to challenge priests to encourage confession and to offer it more frequently. I've heared it said that parishes that only offer confession once a week aren't really offering confession and I would tend to agree. Looking and my fancy little spreadsheet, I looked at all of the Catholic churchs in the northland in Kansas City and figured out that on average they offer confession for one hour a week. That's only an average, so some churches offer it more and some offer it less. I think for many Catholics, confession has gotten a bad rap. They make their kids go before their first communion and that's it. But if it's important enough to send your child, isn't it important for you to go? They may go to a communial reconcillation service during the advent or lenten season. But I doubt they would let six months or a year go by without cleaning their kitchen or bathroom. So why would you let that much time go by before cleaning your soul. Others don't believe it is necessary at all. They believe they can go right to Jesus and don't need to go to a priest. But that's not what the church teaches. I would challenge anyone who believes that to find out what the church teaches. 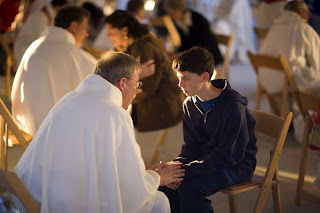 You can off by reading my blog, "Ten Reasons for Going to Confession." So many people don't realize the importance of confession. They don't realize that you cannot take communion if you are in a state of mortal sin without being first reconcilled. Or worst yet, they don't realize that if they are not in a state of grace and they die then they are not getting into heaven. Yet, we don't hear confession being taught from the pulpit. We aren't being told how important it is. I think the lack of confession times tells the laity that it isn't important. I realize that priests are busy and have a lot of things on their plate. I'm not suggesting that they sit in the confessional all day long. The churches that I know that do offer frequent confession offer it 15-30 minutes before daily mass as well as the weekends. The priest has to be there anyway for mass so what's an extra half an hour? I know of a church that offers it 5:30pm on a Wednesday night as well as other times throughout the week. But it's publicized that if there is no one around when confession starts then father will leave. If found it interesting that when I do go to a parish that only offers confession on Saturday afternoon that there isn't normally many people there. On the other hand, the parishes that do offer it frequently normally have 5-10 people in line. Now, either the parishoners in the first church are pure and don't sin or they just aren't educated about how important confession is. How often does your parish offer confessions? Would you go more often if it was offered more frequently?? While confession is advertised as being 45 minutes prior to the Saturday vigil Mass at our parish, I think our priest has given up. I have been at the church many times when not even he showed up. This lent the Bishop asked every church in our Diocese to have reconciliation every Thursday from 6-7. I went twice and the church was totally empty (I lead the music ministry and so have a key). I think you are right when you say that our priests and bishops need to raise the profile of confession. I think this also ties into the fact that most parishioners no longer hear about sin or hell preached from the pulpit. Everybody is getting into heaven because God is merciful right? What a horrible surprise when we find that while merciful, God is also just and that we have chosen our own place in eternity by our inaction.